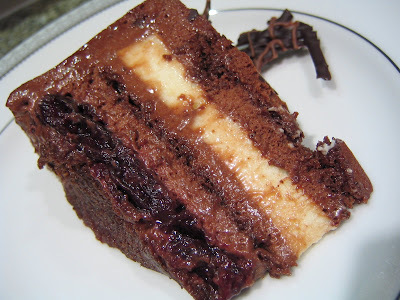 Is the chocolate biscuit, that you reference in the list of layers, a simple cake batter? Or, what is it? March 19, 2007 at 6:33 a.m. Thanks! 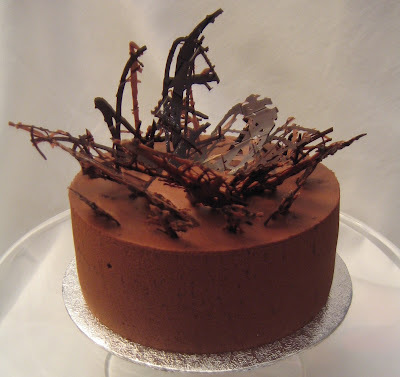 Yes, the chocolate biscuit is a very light thin sponge cake layer which is meringue based. March 19, 2007 at 8:26 a.m. MMMMMMMM!! Your cake looks fantastic. I love Black Forest and it was Dad's favorite too!! March 21, 2007 at 6:24 p.m.
August 4, 2009 at 4:35 p.m.
Beautiful cake. You are SO talented! The safeway black forest cake was my traditional birthday cake as well. It tastes infintely better if it's special ordered with real whipping cream, the price almost doubles but it's worth it. November 21, 2009 at 5:25 p.m.